This family-friendly side dish is a delicious new take on potatoes au gratin. Yes, it’s still cheesy comfort food, but the fresh asparagus means it won’t leave you in a food coma. If you’ve ever made homemade macaroni and cheese, this technique will be familiar: you’ll make a bechamel sauce and top it with buttery breadcrumbs. In fact, you could double the sauce, toss it with pasta, stick it in the freezer and have mac and cheese ready to go whenever you need a quick dinner. For this dish, look for thick asparagus spears (not the pencil-thin ones) which will hold up better when served. Preheat oven to 400°F with rack in highest position. Butter a 3-quart baking dish. Bring a large pot of salted water to a boil over high. Add half of the asparagus and cook until crisp-tender, 2 to 4 minutes (depending on thickness of spears). Remove with tongs, letting excess water drip off, and transfer to prepared dish. Repeat with remaining asparagus; toss with 1 teaspoon of the salt and ¼ teaspoon of the black pepper. Discard water; melt 2 tablespoons of the butter in same pot over medium-low. Whisk in flour and cayenne and cook, stirring constantly, until fragrant and slightly darker in color, about 2 minutes. Slowly whisk in milk. Increase heat to medium, and simmer, whisking often, until thickened, about 5 minutes. Slowly add Gruyère, cheddar, ½ teaspoon of the salt, and remaining ¼ teaspoon black pepper, and whisk until cheese is melted. Pour cheese sauce evenly over asparagus. Melt remaining 2 tablespoons butter in a skillet over medium; stir in Panko and remaining ½ teaspoon salt. Scatter over asparagus. Bake until warmed through, 8 to 10 minutes. Increase oven temperature to broil; broil until breadcrumbs are golden brown, 1 to 2 minutes. 1 In large resealable food-storage plastic bag, mix cumin, salt mix and red pepper. Add chicken to bag; seal, and shake to coat chicken evenly. 2 In 12-inch nonstick skillet, heat oil over medium-high heat. Cook chicken in oil 5 to 7 minutes, turning once, until browned on both sides. Remove chicken from skillet; cover to keep warm. 3 To same skillet, add Rice Mixture ingredients; heat to boiling. Cover; reduce heat to medium-low. Simmer about 15 minutes or until liquid has been reduced by about half. Stir mixture thoroughly; place chicken on top of rice. 4 Cover; continue cooking 12 to 15 minutes or until juice of chicken is clear when center of thickest part is cut (at least 165°F), and rice is tender. Remove chicken to cutting board; cut at angle into 1/2-inch slices; return chicken to skillet. 5 Meanwhile, in mini food processor or blender, place Cilantro-Lime Topping ingredients; blend until smooth, scraping down sides of blender as necessary. Transfer mixture to small resealable food-storage plastic bag, and cut corner off one end; squeeze on top of sliced chicken and rice before serving. 6 Garnish with chopped cilantro and lime wedges. 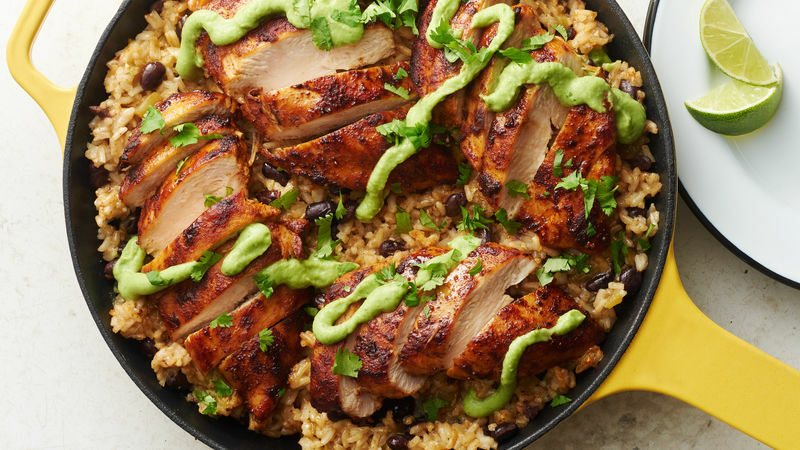 Serve any remaining topping with chicken and rice. In a large pot over medium heat, add the coconut oil and onion. Stir while cooking. Once the onions turn lightly transparent – about 3-5 minutes – add in the garlic, ginger, turmeric, cinnamon, cayenne, and salt. Sauté the mixture for about 1 minute and then add in the carrots and water. Bought some green tomatoes from the grocery store and don’t know what to do with them? Try to make a healthier version of the classic Fried Green Tomatoes. Slice the green tomatoes into thick slices. Pour the almond milk into a small bowl, set aside. Add the almond flour, garlic powder, pink himalayan salt, cayenne pepper and nutritional yeast in a medium sized bowl and stir until well combined. Dip the tomato slices (one at a time) into the almond milk, then into the coating mixture covering both sides completely. Put on a baking tray and bake at 425 degrees for approximately 15 – 20 minutes or until golden brown. Serve with your favorite dip and they are best when served hot.